The long-running and at times innovative American football gaming franchise has returned once again, but will Madden NFL 10 be able to persuade you to fork out another $60 dollars this year? At The 50-yard Line: Madden NFL 10 has introduced a few new features with which to satisfy hungry football fans, but unfortunately not all of them are strongly seen in the actual gamplay. One of the most advertised new additions to the Madden franchise is the introduction of the "Pro-Tak" system that is suppose to bring new realism to the way players tackle each other. The Pro-Tak system is suppose to allow up to nine players pile onto a single ball carrier in an attempt to push him back away from the first down marker. Although this particular feature is one of the most publicized, you rarely see it come into play during the actual games you are competing in. The majority of the time, ball carriers are brought down by at most, two tacklers. Though, at times, you will be able to see the Pro-Tak in action as one player breaks through half of the team for a touchdown. When you do get to see Pro-Tak happen, it is quite an enjoyable experience. We just wish that the system sat on the sidelines a little less often. In addition to the Pro-Tak system, Madden NFL 10 also features other embellishments such as a small, stat-filled halftime show and some new commentary lines. All of these additions brought together make for a very engrossing experience during the game. Smooth As Silk: On the actual gameplay side of your matches, one of the biggest things you will notice altered about Madden NFL 10 is just how smoothly the game runs. From the first kick off to the first interception to the final, bone-crushing tackle of the game everything during the games you play will run fast and very effortlessly. This is a nice change of pace from previous installments in the Madden franchise as in Madden 10; there really is no slowdown. You will be continuously moving from play to play in a very streamlined fashion. It's ALIVE: On the visual side of the game, there are some things that you will see that may have actually taken a step back from previous chapters in the Madden saga. The turf is very lifelike, the stadiums are immensely detailed with high-res fans in the stands and coaches on the sidelines, the jerseys are incredibly realistic and the players...well, that is where we run into a bit of a hitch. 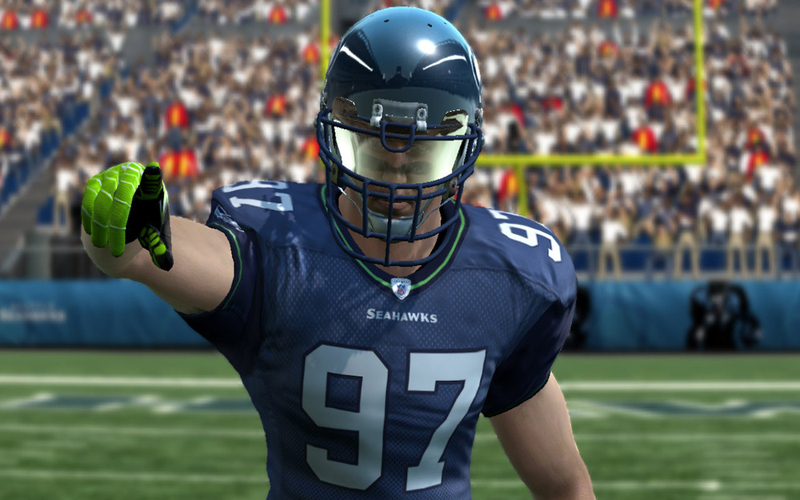 Madden NFL 10 often shows players in the game without their helmets on, and you will be quite surprised when you see what they look like without donning their helmets. Some of the players look simply terrible, and one of the most glaring examples is Payton Manning, the star quarterback of the Indianapolis Colts. Or should we say Frankenstein or perhaps The Hunchback of Notre Dame. NFL Snore Chat: The commentary in Madden NFL 10 has also been changed a bit from Madden NFL 09. You will still hear commentary from Chris Collinsworth but this time he will be accompanied by Tom Hammond, who gives play-by-play coverage of the game. Chris Collinsworth still supplies pretty decent commentary and when he chimes in, often provides interesting analysis on the play that just occurred. Tom Hammond, however, fails to do much of anything except bore you into a lifelong coma. He often only states the obvious and very rarely says anything much of interest. The majority of the time, Collinsworth is the only one worth listening to. As well as the in-game commentary, at halftime you will be treated to a halftime show hosted mostly by Alex Flanagan who will read you the stats of the first half and show you some of the game's highlights up to that point. It is a small halftime show and doesn't really tell you much you don't already know, but nevertheless is a nice addition in engrossing you into the atmosphere of Madden NFL 10. Like Playing The Detroit Lions: There are some hitches besides the commentary in the gameplay though. One of the biggest being that the CPU is way too easy to conquer! The CPU often runs moronic plays, makes bad decisions and does things in your favor for no reason whatsoever. Say you are breathing down their quarterback's neck, instead of throwing the ball away or taking the sack, they simply wait and throw to the worst receiver possible, resulting in many interceptions that really should not have happened if the CPU used any common sense. They will also do completely odd things such as running out of bounds on a breakaway play or their defenders running right past your ball carrier, allowing you for a huge gain. This may all well be intentional though, as EA does have Downloadable Content that you may purchase to unlock the famed "All-Madden" difficulty. Perhaps they made the game exceedingly easy so you will be persuaded to buy the higher difficulty? Rising From The Ashes: Returning this year is the legendary Franchise mode that allows you to take one or more teams through the daily grind of the NFL. From pre-season to the playoffs and finally the Super Bowl, you will be tasked with building one of the best NFL teams of all-time. The Franchise mode has not changed for the most part, but there are some small alterations thrown into the Franchise mode; one of the most major being the exclusion of pretty much anything but games, games and more games. Meaning, instead of preparing your team with training camps before every game, you now simply go from game to game until the season is over and you are into the off-season portion of your Franchise. Although it sounds like a huge difference, you really don't notice it, as there really was never a ton to do before each game in previous installments of the Madden series. You will still be able to sign free agents, trade players and check out your contracts to said players anytime you want, so you are not missing much by cutting training camp before each game. The Franchise mode is still as enjoyable and engrossing as ever and you will undoubtedly, as always, be sucked in for hours on end in a Super Bowl bid. The First Year Is The Toughest: In addition to the Franchise mode, the Superstar mode also makes a return for Madden NFL 10. In Superstar mode you will guide the career of a real NFL rookie (Matthew Stafford, etc.) on the way to super stardom or create your own player to build his budding career. The Superstar mode is very unchanged and you will, as in the Franchise mode, go from game to game in an attempt to become the star of your team. As with the previous times the Superstar mode has been included in Madden, it does tend to get a bit boring after a while as most people want control over players even after they throw the ball away. Every position has its downside. Defensive players rarely get tackles of their own, quarterbacks cannot do anything after they throw the ball, running backs rarely have breakaway plays and wide receivers are rarely thrown to. Rent vs. Buy: Madden NFL 10 is a brilliant game and does, as usual, meet our expectations of what the latest in the cash-cow franchise should be. While it is difficult to imagine Madden NFL 10 being a perfect game, it does come quite close as the Madden franchise does every year. The Madden gaming series is only getting better year after year, but we cannot help but feel like perhaps EA is running out of new features to include in the latest Madden NFL title.